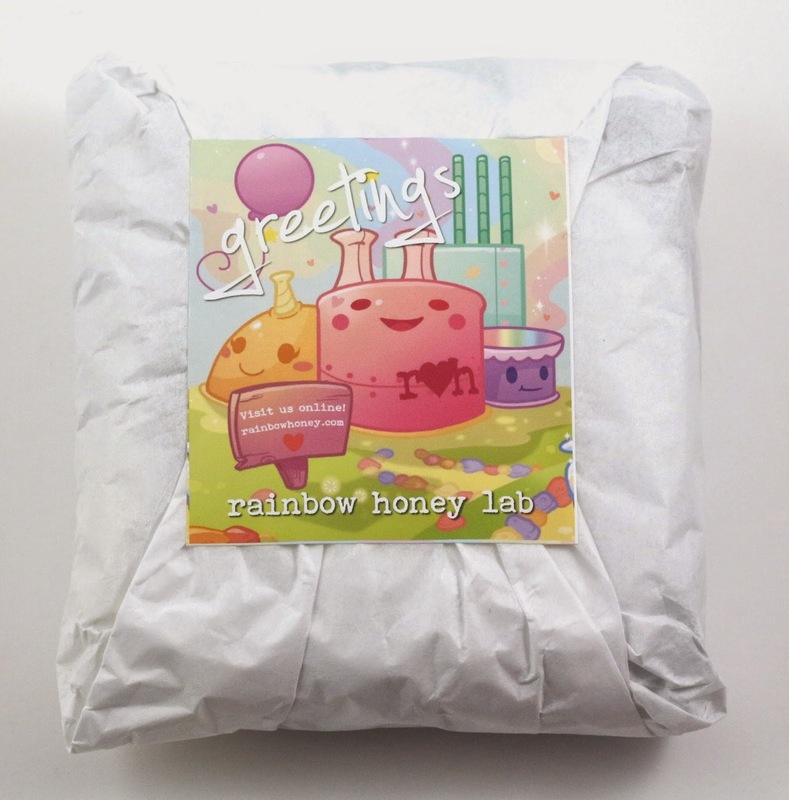 Rainbow Honey recently introduced a subscription bag that started this month, offering the mini or the large size Mystery Bag for $10 or $25 per month respectively. 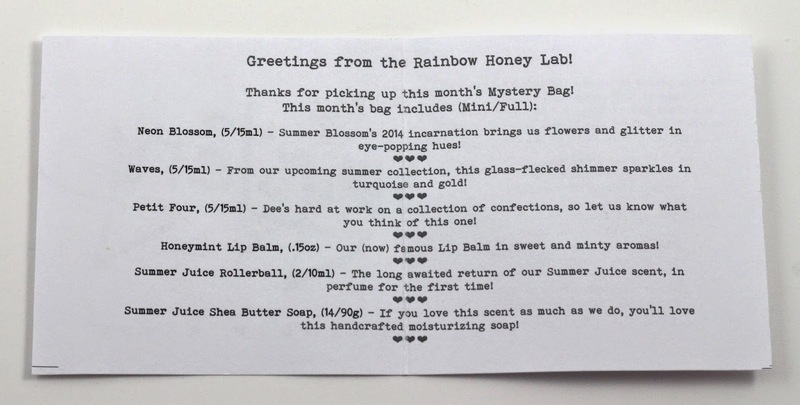 It seems they will still be offering the one-off monthly Mystery Bags as well. It's a great way to try their new products first, because they get released in the Mystery Bag before they are sold separately on the site. 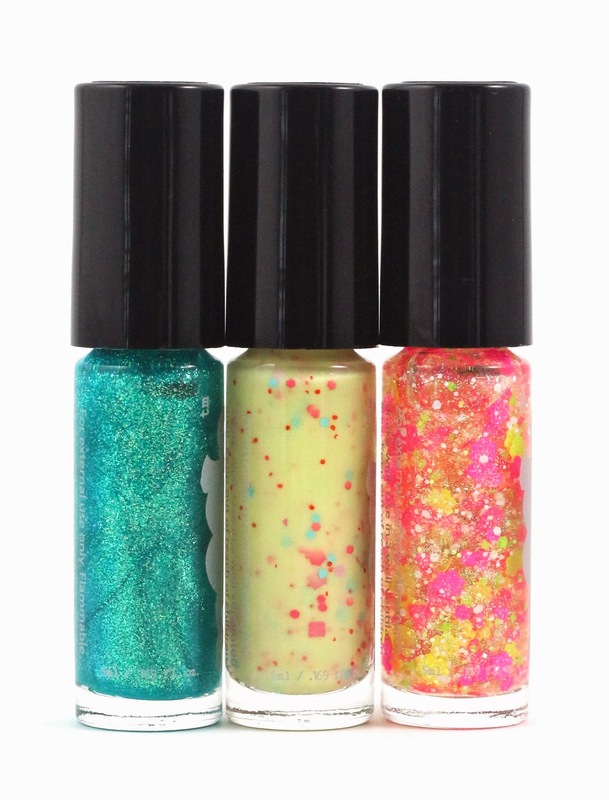 Each version includes 3 completely new polish colors, and a few other beauty products that are new as well. 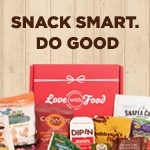 They have been really busy lately with new customers and tons of orders so sometimes they aren't shipped as quickly as they used to be (unless you subscribe, those are always shipped out at the very beginning of the month), but their customer service is amazing, so any problems you have don't hesitate to contact them. The Mystery Bags come wrapped all nice and tidy with bubble wrap, so you really can't see what you got until it's all the way open! Here's the info card that comes with every Mystery Bag. The Lip Balm came in a variety of flavors this month, so you won't really know for sure what flavor you got until you get yours in the mail! Waves - (5ml/15ml) This is a very pretty mermaid blue-green with glitter, very pretty, perfect for toes by the poolside or on the beach. This one will need 3 coats to be opaque. Petit Four - (5ml/15ml) This is very cute I love these pastel crellies with matte glitter shapes in them! This one will be in a future collection inspired by confectionary treats and I cannot wait for that! The color reminds me of a birthday cake macaron I get every year for my birthday in Napa. I did have some problems with this getting very stringy and it was hard to work with. It only needed 2 coats luckily, but you'll have to be quick working with this color. Neon Blossom - (5ml/15ml) This is meant to be a glitter topper, and it has neon yellow and pink matte flower glitter shapes in it, very cute! This would be great over some of the colors from the new Neon Collection. Lip Balm in Honeymint - (.15oz) There were a few flavors of this sent out including Enter Lime!, Honey Bee, and this one. I traded in a swap for the lime because I had a feeling I would be getting something different. I'm glad I did because I got a chance to try both this and the lime. The Honeymint is actually really good, and whatever additional ingredient is in this, it makes it much more like a creamy lip butter instead of a glossy balm. I find this flavors stays on and moisturizes better than the lime does. I would definitely buy the full size of this when they finally sell this flavor. Summer Juice Rollerball - (2ml/10ml) This smells so summery and light and juicy! I traded for one of these as well, so I have two now! I don't know if I like it more than the Rose Nectar from last month, but it's definitely more for summer than spring! Summer Juice Shea Butter Soap - (14g/90g) This tiny soap is so cute! I would love to take it with me traveling, but I wouldn't know what to put it in once it's used. I guess a bag, who knows? It smells just like the perfume, but I have so many soaps I'll just have to try and make sure I use this this summer. 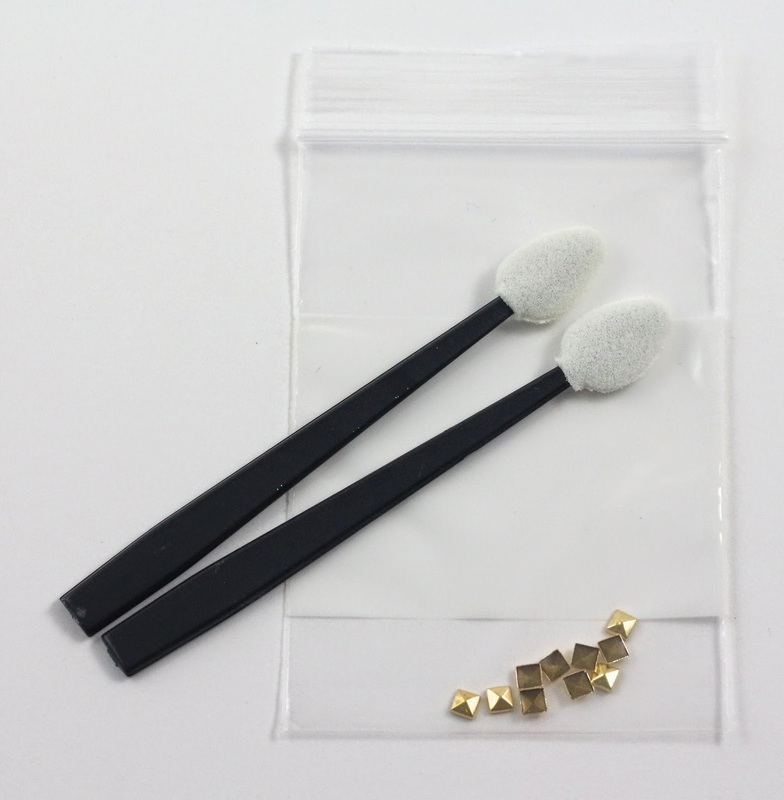 Extras - 10 Gold Studs and Sponge Tip Applicators - These were the same extras included as last month. I saw some of the early bags included orange wood sticks, which I think I would have liked more just because I don't have any and I'm too lazy to go buy some! Summer Juice Exfoliating Sugar Scrub - (large bag only) This is only included in the large Mystery Bag which is the $25 version. Not included in the small one, but if Rainbow Honey will be introducing sugar scrubs soon, that's something I'd be interested in trying! Overall, I really liked this month's Mystery Bag, the colors this month are a little crazier, but I think they're just the thing for fun nails and toes for the summer! I will definitely be purchasing more of this Honeymint Lip Balm, I think they got the formula perfect on it! And I will definitely be getting that confectionary inspired collection when that comes out! How fun would that be! 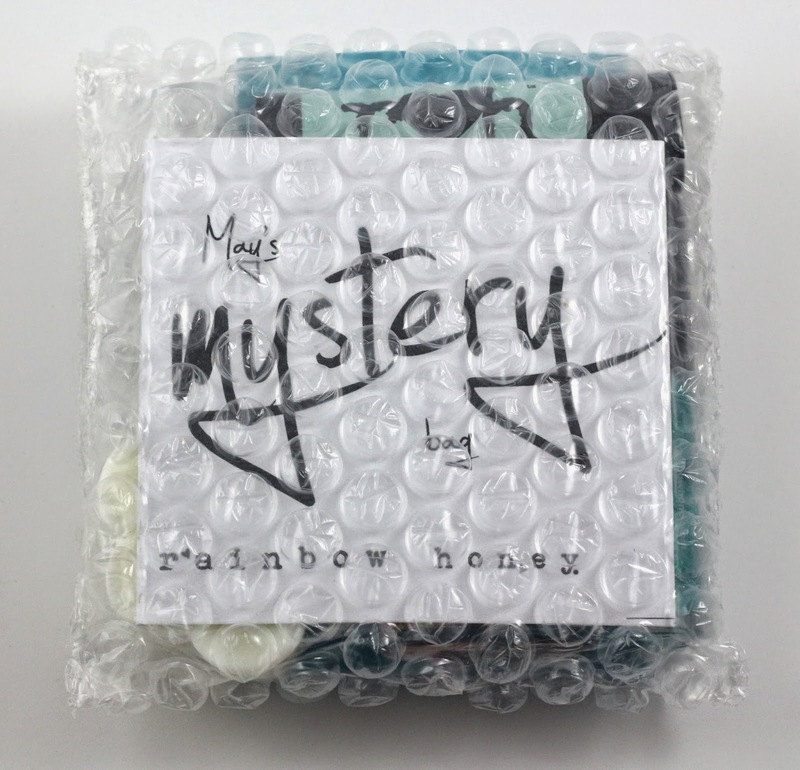 I think I should probably just take the leap and subscribe to the Mystery Bag because I don't know if I would ever not love all the polishes and products every month, and it's so inexpensive at $10/month. Maybe I will next month, but I also like seeing everyone's spoilers first too! Decisions, decisions!